From Central Park to the depths of your heart, Chestnut bounds on to DVD from 4 February 2009! Two adorable orphans, one giant pup and their amazing adventure in the Big Apple - it's all part of the fun that occurs when two little dog lovers follow their hearts, and do what they must, to prove they love their dog in - Chestnut: Hero of Central Park, released to DVD 4 February 2009! When young dreamers, Sally Ann (MACKENZIE VEGA) and Ray (ABIGAIL BRESLIN, Little Miss Sunshine) rescue a Great Dane from an oncoming truck, outside the front of their orphanage, all their doggy dreams are realised. After years of wishing for a puppy pal, the two decide it must be heaven sent - and decide to hang on to him, naming the charismatic canine, Chestnut. While they believe he was a gift from the gods, they soon suspect the nuns who run their convent may not feel the same way, and the girls must set about keeping their super-sized secret under wraps. A tame task, perhaps - but that is only the start of things to come when the two girls find themselves lucky enough to be adopted by loving couple Matt and Laura Tomley (JUSTIN LOUIS and CHRISTINE TUCCI). Facing the move to a New York apartment with their new 'parents', the girls let Chestnut loose in Central Park. What ensues is a tale of hilarity and misadventure, as Sally Ann and Ray try and keep tabs on their ever-growing furry friend, discovering along the way that poor Matt has an allergy to animal hair, and Chestnut has a nose for sniffing out small time thieves! Directed by Robert Vince (Air Buddies) and filled with charming performances by Academy Award ® Nominees, this inventive tale of love, courage and learning to trust those around you is sure to have audiences begging for more! Including a behind the scenes bonus features, this is a family comedy to watch together time and time again. 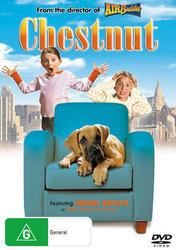 Chestnut - Hero of Central Park is available to own on DVD from 4 February 2009!